In this century-old house, right by the nice and spacious Lafontaine Park, hides one of the best spots in town. If you want to experience the real Montreal, you should head to this hostel without a doubt. 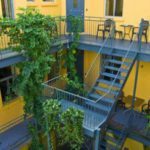 For the past 25 years, this hostel has earn for itself an irreproachable reputation thanks to its location, right by the Lafontaine Park, the inspiration for the name of this charming 21-rooms hostel. 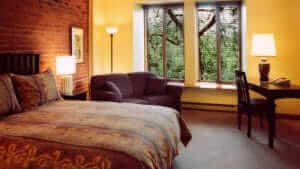 The most expensive rooms face the park (the most popular rooms feature brick walls). Customers come to this hostel for its quietness and its relaxed atmosphere so typical of the city and, more specifically, of this neighborhood. A getaway from downtown’s frenziness, you’ll easily adjust to the neighborhood’s vibe if you take on biking, jogging in the park, or shopping in the trendy Plateau. The warm welcoming and the efficient service are on par with what he great hotels located downtown (wifi is available in all rooms) have to offer and the breakfast made of organic produce is tasty (and included in the price of the room). A kitchen is even available for those who’d like to cook all their meals to feel at home… Despite all these perks, the hostel is not resting on its laurels and is currently undertaking a modernization project. This especially affects the dated decoration, a welcome update! This hostel is the kind that we’d like to find more often in Montreal. 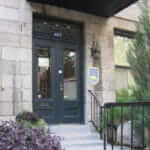 The hostel De La Fontaine is located on Rachel Street, one of the main arteries of the Plateau, the iconic neighborhood of Montreal. The closest metro station is at 10 minutes walking distance (Mont-Royal metro station, line 2 – Orange) and the hostel is also served by two bus lines that meet downtown. On nice days, everything is easily accessible by walk or by bike.